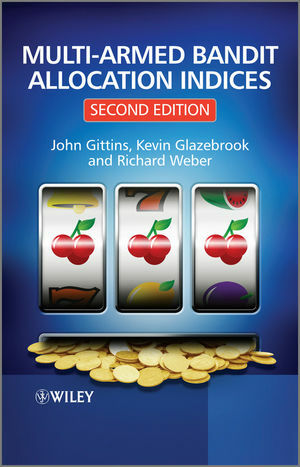 In 1989 the first edition of this book set out Gittins' pioneering index solution to the multi-armed bandit problem and his subsequent investigation of a wide of sequential resource allocation and stochastic scheduling problems. Since then there has been a remarkable flowering of new insights, generalizations and applications, to which Glazebrook and Weber have made major contributions. This second edition brings the story up to date. There are new chapters on the achievable region approach to stochastic optimization problems, the construction of performance bounds for suboptimal policies, Whittle's restless bandits, and the use of Lagrangian relaxation in the construction and evaluation of index policies. Some of the many varied proofs of the index theorem are discussed along with the insights that they provide. Many contemporary applications are surveyed, and over 150 new references are included. Over the past 40 years the Gittins index has helped theoreticians and practitioners to address a huge variety of problems within chemometrics, economics, engineering, numerical analysis, operational research, probability, statistics and website design. This new edition will be an important resource for others wishing to use this approach. 2 Main Ideas: Gittins Index. 2.3 Simple families of alternative bandit processes. 2.7 Proof of the index theorem by interchanging bandit portions. 2.9 Proof of the index theorem by induction and interchange argument. 2.10 Calculation of Gittins indices. 2.12 History of the index theorem. 2.13 Some decision process theory. 3 Necessary Assumptions for Indices. 3.5 Beyond the necessary assumptions. 4 Superprocesses, Precedence Constraints and Arrivals. 4.3 The index theorem for superprocesses. 4.5 Proof of the index theorem by freezing and promotion rules. 4.6 The index theorem for jobs with precedence constraints. 4.7 Precedence constraints forming an out-forest. 4.8 Bandit processes with arrivals. 4.10 Near optimality of nearly index policies. 5 The Achievable Region Methodology. 5.3 Proof of the index theorem by greedy algorithm. 5.4 Generalized conservation laws and indexable systems. 5.5 Performance bounds for policies for branching bandits. 5.6 Job selection and scheduling problems. 5.7 Multi-armed bandits on parallel machines. 6 Restless Bandits and Lagrangian Relaxation. 6.3 Whittle indices for restless bandits. 6.5 Monotone policies and simple proofs of indexability. 6.6 Applications to multi-class queuing systems. 6.7 Performance bounds for the Whittle index policy. 6.8 Indices for more general resource configurations. 7 Multi-Population Random Sampling (Theory). 7.3 Use of monotonicity properties. 7.4 General methods of calculation: use of invariance properties. 7.7 Asymptotically normal reward processes. 8 Multi-Population Random Sampling (Calculations). 8.2 Normal reward processes (known variance). 8.3 Normal reward processes (mean and variance both unknown). 9.5 More on job-scheduling problems.